Chelsea vs Tottenham Match Preview (27/02/19): Beleaguered Blues to Regroup in Style? How on earth could we summarise the Carabao Cup final against Manchester City in concise fashion? We should start by mentioning the performance level, which was excellent. We stifled City and restricted them to just three shots on target in 120 minutes, and while we rarely attacked ourselves there were times when we looked dangerous on the break. The players were disciplined, organised and looked hungry, and even Eden Hazard – in the false nine role he is supposed to detest – put in a cracking shift despite being isolated at times. Those are the positives. The negatives are that we lost and became something of an international laughing stock; not ideal. The Kepa Arrizabalaga situation drew ire from many within the game, and even though the goalkeeper has since been fined and publicly apologised, it does leave a bitter taste in the mouth. Be under no illusions: whether the Spaniard was injured or not, Maurizio Sarri wanted to get Willy Caballero onto the field. The former Manchester City man is something of a penalty-saving specialist, and it seems highly probable that the manager wanted to make the tactical switch regardless of Kepa’s cramp. The insubordination should not be tolerated. It’s easier said than done, of course, but ideally we would draw a line under the situation rather quickly: Tottenham visit the Bridge on Wednesday evening, and victory would see us cut the gap to our capital rivals to seven points, with a game in hand into the bargain. Can the Blues turn a monumental negative into a positive this week? The big question now is will Kepa play on Wednesday? The Spaniard can expect a backlash of sorts from the home crowd if he does, and despite Sarri’s insistence that the matter is over it might be wise to give Caballero the nod. Two notable absentees from the starting eleven at Wembley were Marcos Alonso and Gonzalo Higuain. The former was dropped after some poor performances of late, there’s no doubt about it, and he will perhaps have to concede the left back slot to Emerson Palmieri for the foreseeable future. As for Higuain, his dropping was presumably for tactical reasons, but the Argentine can expect to be restored here with Hazard starting on the left. 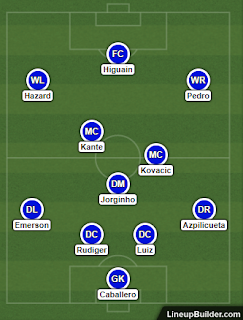 In midfield, Mateo Kovacic will surely come in for Ross Barkley, while the rest of the Wembley starters will be given the chance to shine once more. A rivalry forged in geography and strengthened by the events of the 2015/16 campaign, it’s never dull when Chelsea and Tottenham meet. There have been more than 160 meetings dating back a cool 110 years, with the Blues enjoying the upper hand on their rivals for much of that period. Spurs have improved of late, of course, and our last ten encounters have ended with four wins for Chelsea, four for Tottenham and two draws. That fateful night in May 2016, when a Hazard brace ended Tottenham’s title hopes on a feisty evening, has informed all of our fixtures ever since. Expect another tasty affair on Wednesday! There are no great mysteries to the way that Tottenham play football under Mauricio Pochettino, although that doesn’t necessarily make it any easier to stop them. Harry Kane through the middle, Son Heung-Min floating around in a free role and Christian Eriksen pulling the strings; it’s a deadly combination, and one that requires some stopping. Defensively they are sound too, with only Manchester City and Liverpool conceding fewer goals, and it’s a recipe for success that sees them climb up to third in the table. Of course, they’re not unstoppable, and as Burnley showed at the weekend if you get in amongst them they can be vulnerable to a physical opponent. That’s not really Chelsea’s style, but if Maurizio Sarri can elicit a high octane, energetic performance from his side, in which we – and this is the important part – zip the ball around at a rapid rate, we could break them down as we did the Carabao Cup semi-final second leg. An interesting stat that should fill the Blues faithful with confidence is that Tottenham concede at a rate of greater than a goal per game on the road this term, and so for all their obvious gifts we should be looking to attack and get our campaign back on track at the Bridge in midweek. Chelsea vs Manchester City Match Preview (24/02/19): Can the Blues Produce a Season-Defining Performance? Progress can take many forms. Sure, we would have liked to have blown away Malmo on Thursday night and made a real statement of intent ahead of Sunday’s EFL Cup final against Manchester City. But arguably more important was securing the right result while handing a rest to some key figures. So the 3-0 win, secured with goals from Olivier Giroud, Ross Barkley and a stunner from Callum Hudson-Odoi, was all the more pleasurable in that the likes of Eden Hazard, Gonzalo Higuain and David Luiz didn’t have to get their boots dirty. Yes, there was still discontent inside the Bridge, and why anyone would want to boo Jorginho – a player simply doing his job as per the manager’s instructions – is baffling. We hate it when players DON’T play for their manager! Either way, at least some dignity was restored after a tough time of late…let’s hope that remains intact after Sunday’s Wembley trip. Manchester City are running riot, as ever, and this is the first opportunity for either side to get some early season silverware in the cabinet. Hopefully, it will be the Chelsea blue ribbon that is tie to the trophy’s handles. There have been some injury concerns in the camp, but hopefully none of those will prove problematic in Sarri’s team selection for Sunday’s game. Kepa Arrizabalaga has picked up something of a hamstring problem, and he is now rated as 50/50 at best to feature, with Willy Caballero standing by. Meanwhile, Pedro is struggling with stomach cramps, but he should be fit to take to the Wembley turf. Ruben Loftus-Cheek is still working his way back to full fitness following his back injury, and Davide Zappacosta has been ill this week. But, assuming Pedro is fit, the only problem we face is in Kepa’s likely absence. There will be no questions asked here and no quarter given: Chelsea have to win this match. And so the manager will field his strongest eleven. 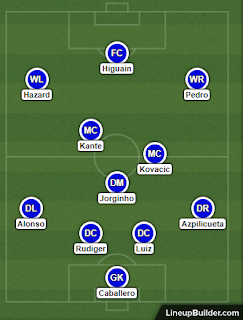 That means a back four, from right to left, of Azpilicueta, Luiz, Rudiger and Alonso, with the normal midfield trio of Jorginho, N’Golo Kante and Mateo Kovacic looking to produce a better balanced display in the middle of the park than they have done of late. In attack, we have potential match winners in Eden Hazard and Gonzalo Higuain, while Pedro – if fit – will presumably be selected on the right flank for his greater work rate from a defensive perspective than that of Willian. As is the case with the vast majority of teams in English football, Chelsea’s modern day record against Manchester City isn’t all that great. We’ve lost four of our last five meetings with the champions, including that 0-6 romp just the other day. Widen the lens a bit further and dating back to the start of 2010, our record against Pep Guardiola’s men reads W8 D3 L13. The only real high point in that run was the 5-1 victory we enjoyed in the FA Cup back in 2015/16, so hopefully we can summon up some of that kind of spirit on Sunday. The problem with playing this Manchester City side is you just don’t know how they are going to play. Pep Guardiola prides himself on his tactical flexibility (a few other Premier League managers could learn a lot from him, naming no names), and that makes it a nuisance to try and pre-empt what he might do. Normally, City line up in either a 4-1-4-1 or 4-2-3-1 system, with Fernandinho the midfield rock upon which their success is built. With the Brazilian in the side, the likes of David Silva and Kevin de Bruyne can go and enjoy themselves, with Bernardo Silva and Raheem Sterling drifting in off the flanks to support Sergio Aguero. Of course, Guardiola is no stranger to springing a surprise either, as he did on Wednesday evening when he played a sort of 3-2-4-1 set-up at Schalke in the Champions League. The change came when Nicolas Otamendi was sent off after 68 minutes, but City were already 1-2 down at this point; clearly, their normal formation wasn’t working. And so Guardiola earned his corn by subbing on Vincent Kompany and Leroy Sane, switching to three at the back and going hell for leather: two goals in the space of five minutes turned the tie completely on its head in City’s favour. And so we need to be wary of such tactical efficiency, and hopefully Maurizio Sarri has plans A, B and C up his sleeve to combat City’s attacking swagger. We cannot outscore them, it’s that simple, and so the Italian will have to find another way to operate if he wants to get his hands on his first piece of silverware as Chelsea manager. With six months in the job under his belt, Maurizio Sarri’s Chelsea should not be playing ‘confused’ football; as the manager described the team’s efforts in the 0-2 loss to Manchester United in the FA Cup on Monday. The Italian has had plenty of time to work with his players, and by now they really ought to know his tactics inside and out. But yet again, the Blues delivered a disjointed performance against the rampant United, and individual errors once again cost us dearly. Quite why David Luiz sauntered out to close down Marcus Rashford as if he was having a gentle stroll in the countryside is anybody’s guess, but naturally the England international had the time to pick out a cross for Paul Pogba, who the rest of our defence watched sprint 20 yards or so to connect with the header. As for Kepa Arrizabalaga’s attempts at keeping out Pogba’s effort…well, the less said the better. We showed occasional glimpses going forward, with Gonzalo Higuain in particular looking lively, but it was another fairly lacklustre effort and the fans inside Stamford Bridge let everybody know about it. Chants of ‘you’re getting sacked in the morning’ emanated from both the home and away ends, while the names of Frank Lampard and John Terry were sung as the home faithful made their opinions known. Will Sarri survive the week in charge? You suspect he might…but only if we get the result against Malmo in the Europa League last 32 second leg on Thursday. “We played confused football in the second half, but in the first half we played well,” was his reflection afterwards. “I'm worried about the result but not about the fans' reaction, because I understand the situation. I can understand our fans because the result wasn't really good and we are out of the FA Cup. The manager played what is ostensibly his strongest starting eleven against United, and so that would lead us to assume changes will be made for Thursday’s tie. It’s a risky strategy, mind you, as Malmo should not be underestimated. We have two away goals, true, but you just never now. And, clearly, defeat will spell the end of Sarri’s tenure in charge. So expect Kepa to start in goal, with possibly Andres Christensen partnering Antonio Rudiger in the middle of defence and Cesar Azpilicueta on the right and Emerson Palmieri on the left. 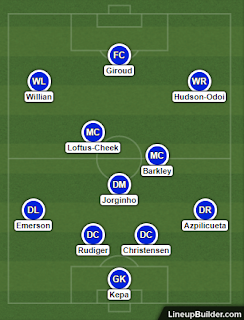 Midfield is a conundrum, but we would expect Ross Barkley and Ruben Loftus Cheek to start…possibly with Jorginho in his normal sitting role. In attack, as much as the budding partnership between Higuain and Hazard is exciting, both will presumably be given the evening off here with Olivier Giroud, Willian and – hopefully – Callum Hudson-Odoi being let off the leash. As mentioned in our preview of the first leg of this tie, that was the first time that Chelsea and Malmo had met in competitive action. As such, we can boast a 100% record against our Swedish opponents…for the time being at least! So what did we learn from the first leg? First up, Malmo were happy to sit in, make themselves compact and let us pass the ball around. The Blues enjoyed 74% possession, and played 759 passes compared to the Swedes’ 268. They mustered just two shots on target – one of which they scored from, and to be honest they looked a mirror image of the Swedish national side that grinded their way to the knockout stages of the World Cup last summer. The context at the Bridge is much different, of course. Malmo will need to score twice to have a chance of progressing – one away goal won’t be enough – and that will surely predicate that they go about their business a little differently on Thursday. You wouldn’t imagine that front-foot football will suit them at all, and if they do throw bodies forward then our pace on the break – particularly Willian and Hudson-Odoi on the flanks and Loftus-Cheek through the middle – would be devastating. If Chelsea score, this tie as a contest is all but over. So let’s hope there’s no ‘confusing’ football from the Blues, and they get that early goal that will enable them to play in confident fashion. Given our woes in the league, the various cup competitions are providing Chelsea with a very welcome distraction right now. Into the final of the Carabao Cup, we also have one foot in the last 16 of the Europa League after a 2-1 win in Malmo on Thursday. In a move which showed his desire to progress in the competition – winning it might be our best of a Champions League place next season, after all – Maurizio Sarri named a strong starting eleven, and was rewarded with a decent performance to win back some confidence lost in the 0-6 hammering against Manchester City. Ross Barkley opened the scoring, toe-poking home after a Pedro cross made its way to him in the penalty area, before Olivier Giroud doubled our advantage with a cheeky flicked finish following good work from Willian. That should have been that, but a momentary lapse of concentration allowed the Swedes to pull one back in the 80th minute. Hopefully, that should prove to be nothing more than a consolation goal in the grand scheme of things, and with two away goals in the locker we should enjoy serene progress from next week’s second leg at the Bridge. In the understatement of the century, Sarri said afterwards that his team needs to be more consistent. “In the last period we've had the problem of up and down, up and down. Hopefully, that resonates with the players ahead of Monday’s FA Cup fifth round tie with Manchester United. Victory there would take us one step further to another cup final….which ultimately might see Sarri keep his job come the end of the season. With a decent four-day gap before our next match, the manager decided to field a strong eleven in Sweden. The likes of Azpilicueta, Luiz, Jorginho and Pedro all started, perhaps surprisingly so, and that indicates Sarri’s aspirations in the Europa League. They could all still start against United on Monday, such is the recovery time, and we expect the manager to name his best possible eleven in order to progress to the last eight of the FA Cup. The only injury doubt is Ruben Loftus-Cheek, who is struggling with his back, but otherwise Sarri has a full quota to work with. We can delve into the history books to examine the history between these two storied outfits, but perhaps the most pertinent stat is the one that governs the modern day. In the last 17 clashes between the two sides, Chelsea have only lost twice, with nine wins and six draws. Our unbeaten run against United at Stamford Bridge extends back to 2012, and so we have every right to be confident ahead of Monday’s game! For those that enjoy a deeper look at the head-to-heads, Chelsea have won 54 of the 181 competitive meetings between the two teams, with 50 draws and 77 United victories. As we know, Manchester United are flying under Ole Gunnar Solskjaer’s management, with lots of wins and just a solitary defeat to PSG in the Champions League on Tuesday. To be fair, the job he’s done hasn’t exactly been rocket scientist: shaking off the conservatism that dogged Jose Mourinho at Old Trafford (and Stamford Bridge, for that matter, in his latter years), he set his best attacking talents free and removed the shackles from Paul Pogba. Now, the United players are proving their worth, and as of right now they are one of the most dangerous teams in the land. But the loss to the Parisians may have knocked them a bit, and injuries to Jesse Lingard and Anthony Martial may just complicate matters. Nevertheless, we will have to be at our best to see them off, particularly given their improved attacking impetus of late. They have kept clean sheets in each of their last four away games in the league, and that tells us just how difficult they will be to beat. But as we know, this Chelsea side is capable of anything across the course of a 90-minute game; from the sublime to the ridiculous. If Hazard and Higuain bring their best, we can certainly get the job done on Monday evening. Some home truths have hit the mark this past week for Chelsea fans. Simply, we cannot compete with the elite sides at the moment, as displayed in the 0-6 hammering at the hands of Manchester City on Sunday. Is the Sarri-ball revolution a myth? Perhaps, perhaps not, but it is evident that we don’t have a Plan B to turn to when our possession-based game doesn’t yield a breakthrough. 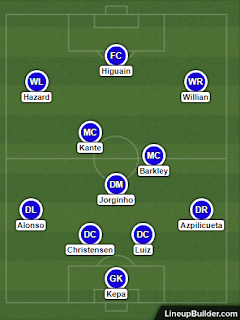 And the manager really does need to consider why he is playing N’Golo Kante, a two-time Premier League winner and World Cup champion as a defensive midfielder, in an advanced role while Jorginho, a sublime passer of the ball, really ought to be linking up play higher up the pitch. In our last three away outings we have lost each to a combined score of 0-12, and that really is despicable for a side aiming for Champions League qualification this season. Of course, the players have to shoulder some of the responsibility too. Remember how they folded in Jose Mourinho’s fateful final campaign, or how they behaved like spoilt kids towards the end of Antonio Conte’s reign? The parallels are alarmingly similar. According to the papers, Sarri has a month to save his skin; a month that encompasses this two-legged Europa League tie against Malmo, the Carabao Cup final, an FA Cup Fifth Round clash with Manchester United and a league date with Tottenham. It doesn’t look good for the Italian. He should be given more time to rebuild the squad in his own vision, that much we do know, and it would be a shame if the Italian is shown the exit door. That said, a drastic improvement is essential….starting on Thursday against Malmo. There are two ways to look at team selection for this game. We need to win it, there’s no doubt it, and for that reason Sarri might be tempted to play his strongest available eleven….whatever that is right now. More likely, he will go with the fringe players once again, and give them an opportunity to stake a claim for a starting berth. Kepa will probably start in goal – he has done in other Europa League ties, with Zappacosta, Christensen, Ampadu and Emerson at the back. In midfield, Mateo Kovacic may be forced into playing the anchor man role, with Ross Barkley and Ruben Loftus-Cheek in front of him. 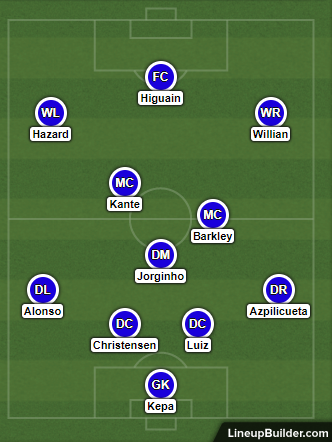 In attack, well, there is a vacancy for a right winger….so Callum Hudson-Odoi and Willian should treat the visit to Sweden as a dress rehearsal. Through the middle, Olivier Giroud will be looking to make a nuisance of himself as ever. This will be the first time that Chelsea and Malmo have locked horns in competitive football. The Swedes have kept a low profile in continental football, and they are perhaps best remembered for their 2015/16 Champions League campaign when they lost 0-4, 0-5 and 0-8 to Shakhtar Donetsk, PSG and Real Madrid. The last time they faced British opposition was in qualification for the 2013/14 Europa League. They beat Hibernian 9-0 on aggregate, before going down 0-4 to Swansea. Malmo are currently on their break in the bleak Swedish winter with their domestic season yet to start, and they haven’t played a competitive match since December. That can work both ways: their players will be well rested, of course, but will they be rusty and lacking that competitive edge? It’s certainly possible, and that should be an advantage for us. Malmo will play either 4-4-2 or 5-3-2, and the emphasis will be on not conceding an away goal here. As such, we will enjoy plenty of possession – when don’t we? – but the difference here is that we really need to make it count. No slow tempo, sideways passing; let’s get the ball forward in straight lines that breaks through the Swedes’ organisation. Malmo’s top goalscorer last season was Jo-Inge Berget, but he has since left the club and with just ten goals he was hardly the most prolific of frontmen anyway. Like the Swedish national side at the World Cup, Malmo will be tough to break down, with deep lying midfielders and forwards that drop in to support when not in possession, which will be often. What we need is our dynamic, forward-moving players – think Loftus-Cheek, Hudson-Odoi and Willian – to break the lines and create space by dragging their opponents out of position. It could be an evening of hard slog, but our greater match fitness should ultimately yield the result that Sarri wants and needs. Manchester City vs Chelsea Match Preview (10/02/19): Will It Be Dr Jekyll or Mr Hyde for the Blues on Sunday? 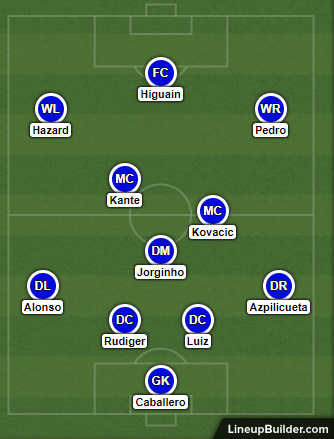 It would be fair to say that, right now, this Chelsea side has something of a multiple personality complex. Hopeless against Arsenal and Bournemouth, inspired against Tottenham in the Carabao Cup, the Blues once again proved the detractors wrong with a sublime showing in the 5-0 win against Huddersfield last time out. Let’s be under no illusions: we fully expected to beat the Terriers, and anything but the three points would have been considered a minor disaster. But there’s winning and then there’s winning with style, and it would be accurate to conclude that the Blues’ romp fell firmly into the latter category. Most salivating of all was the link-up play between Gonzalo Higuain and Eden Hazard, who ended up with two goals apiece and who looked to be perfect footballing foils. For a long time we’ve been crying out for someone with the Argentine’s intelligent play and clever runs into space, and it’s quite possible that he can help to elevate Hazard’s game to even greater heights. Maurizio Sarri certainly seems to agree with that estimation. “Higuain is improving. He wasn't physically at the top when he arrived, because he had a back problem and wasn't involved, so only played a few matches,” the manager said. David Luiz popped up late to add the fifth goal and complete the scoring on a fantastic day for the club. Of course, much more difficult tests are yet to come, and arguably they don’t come any tougher than Sunday’s assignment against Manchester City. Back in the thick of the title mix, Pep Guardiola’s side are back in form and will be desperate for the three points in this dress rehearsal for the Carabao Cup later in the month. As for us, just maintaining the good vibes from the Huddersfield game is key. There are no new injury concerns for Sarri to consider, and so from that perspective there really is no need to change a starting eleven that purred on Saturday. That would mean Andreas Christensen keeping his place at the expense of Antonio Rudiger, with Marcos Alonso seemingly welcomed back into the fold in place of Emerson. In midfield, Ross Barkley was preferred to Mateo Kovacic against Huddersfield – will that continue against City? 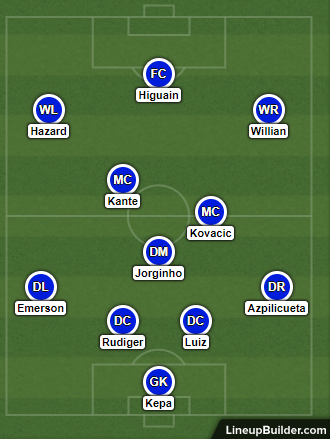 In attack, we are simply ravenous with the prospect of Higuain and Hazard linking up again, with Willian also contributing from the right flank. Despite occasional gaps of a few years, the rise, fall and rise again of Chelsea and Manchester City have been spookily linked. In the ‘good old days’ we sort of rose up and down the leagues together, regularly locking hors in the top flight and the second tier. We became more settled from the 1990s onwards, although it took City a bit more time to become a first division regular again. And then the foreign investment cam for both clubs, and we all know how that story has panned out thus far. All in all, we’ve met on 161 occasions, with Chelsea winning 55 and losing 67. In the modern era we’ve shared the bulk of our meetings, with one draw in the last ten, four Chelsea victories and five for City. You can never be quite sure of which players Pep Guardiola will deploy; he is a tinker man in his own right. But one thing that is for sure is that whoever he brings in will be high quality. There are no weaknesses in this City side, and even with Aymeric Laporte covering at left back they remain defensively sound. Clearly, Hazard drifting off the left and linking up with Higuain in pockets of space in front of their defence will be key. There could be a good old battle in midfield, with our trio locking horns with three of Fernandinho, De Bruyne, Gundogan or David Silva in the middle of the park. In wide areas, the danger is our full backs becoming exposed against the pace of Raheem Sterling and the guile of Bernardo Silva. We would not be surprised at all to see N’Golo Kante deployed in the deeper role for which he became best known at Leicester and in our title-winning campaign. We want Willian to stay wide here and occupy Laporte, which would leave Hazard and Higuain up against, perhaps a central defensive partnership of John Stones and Nicolas Otamendi. It’s certainly an area of the field we can exploit with relish. In football, as in life, there is nothing more frustrating than taking one step forward followed by two back. We were guilty of it ourselves in our preview of the Bournemouth game, titling it ‘Blues Back In the Zone After Cup Magic’. How wrong we were. Of course, you can forgive us for the error given the nature of the beast. We had secured a place in the final of the Carabao Cup with a rollicking performance against Spurs, and then followed up with a comfortable victory over Sheffield Wednesday in the FA Cup. We certainly weren’t expecting to be beaten so comprehensively by Bournemouth on Wednesday evening. As we also alluded to in that preview, the Cherries are a dangerous side under Eddie Howe’s front foot style, but even they must have been surprised with the ease with which they cut through our defence. After a goalless first half, Bournemouth ran riot in the second, blasting four goals without reply in what was one of the Blues’ more spineless performances in recent years. Yes, we had chances, and Cherries keeper Artur Boruc saved well from Mateo Kovacic early on, but once again this was a performance of style over substance in the one area that the beautiful game is truly governed by: putting the ball in the back of the net. Quite frankly, we are over reliant on the brilliance of Eden Hazard, and unless Gonzalo Higuain comes to the party in the next couple of months our hopes of a top four finish look slim. It’s hard to say if Saturday’s game against Huddersfield at the Bridge has come at a good or bad time. The Terriers are the weakest side in the Premier League, as proven by the naked eye and the league table, and with a new manager at the helm they are a side in transition and, perhaps, becoming accustomed to the idea of relegation. That gives them a free hit against us at the weekend then, with all eyes on Maurizio Sarri’s mis-firing Blues. It will be interesting to see if his players show an appetite for the fight…. With his team selection in recent weeks, Sarri has made his thoughts known. It’s now confirmed that Emerson Palmieri is his first choice left back, with indifferent performances from Marcos Alonso costing him his place in the side. And in midfield, Mateo Kovacic continues to retain his place at the expense of Ross Barkley, Ruben Loftus-Cheek and others. It appears as though the manager will place all his faith in Higuain as the central striker, while Willian may be recalled to the starting eleven at the expense of Pedro on Saturday. Otherwise, it’s very much a case of as you were as we look to get our league campaign back on track. The majority of the 67 meetings between Chelsea and Huddersfield came in the first half of the 20th century, when the Terriers were very much a top flight outfit. Such encounters have been sparse in recent times, and the three Premier League clashes we have had since the Yorkshiremen returned to the top flight are the only contests to have taken place in the past decade. We’ve won 3-0 and 3-1 at the John Smith’s Stadium, although the Terriers managed to nick a point at the Bridge last season in a 1-1 draw. There’s a new man at the helm of Huddersfield in Jan Siewert, but his task of keeping the club in the Premier League is a mountainous one. He simply does not have the quality at his disposal to win top flight football matches, and while there is a touch of class to Aaron Mooy and the likes of Steven Mounie and Laurent Depoitre in attack are a handful, it’s not enough to accumulate the necessary amount of points for survival. But they aren’t called the Terriers for nothing, and the nickname sums up their playing style rather well: this is a hard-working, diligent team that makes up for its lack of class with sheer bloody endeavour. We will have to match them in that department, no doubt about it, and hope that our extra class ultimately wins the day. Huddersfield will probably line up in a 4-4-1-1 style set-up, and the onus will be on us to make something happen. And we’re not talking pretty passing movements, as the Blues can rightly be accused of. We mean actual end product. Our visitors have scored the lowest amount of goals in the Premier League this season, and have won 1/11 on the road. If we don’t triumph on Saturday, it’s hard to know where we will go from there.